Harrison loves feet. Like, a lot. Maybe this is totally normal. I don't know. But his love for feet seems to border on obsession. I want to be supportive, so I let him feel his feelings and now he is teaching me. He thinks feet are cool, and I'm like "eh, I could take 'em or leave 'em", so he is showing me all the things that feet are good for. I mostly just use mine for walkin' but apparently I have been missing out on a whole world of feet fun. You can hug or cuddle with feet. You can grab them by the toes and shake them back and forth like pom poms. If you hold them up to your ear you can hear the ocean. You can set things on top of them. This is a new one. 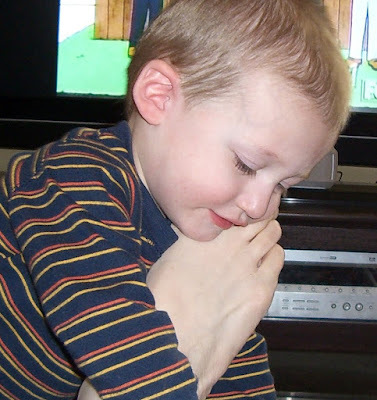 If we are sitting still, he will put things on top of our feet, like crackers, the remote, paper clips, whatever. Wrestling. Yes, feet are good for wrestling with. He likes to lay on our feet and roll around and say "Aaaagh! Eeeaaack!" There are a few things he thinks feet are good for that I just can't get behind. For example; He is always trying bite our toes. Or the toes of visitors. Any toe within reach, really. This makes people a little uncomfortable. 20 times a day I tell him "No biting toes!" but he doesn't listen. I have tried telling him "Bite your own toes! ", and will sometimes hand him his feet so he will have something besides my feet to chew on. The other night he was sitting on our bed and started whining. I looked over to find him trying desperately to bite his own toes. Instead of pulling his feet up to his mouth, he was trying to bend over to get them. But his legs are way to short, and he is still too top heavy and each time he started to bend over for his toes he would just fall forward onto his face. It was very frustrating for him. And very funny for me. I know I probably shouldn't laugh, but babies are just too funny sometimes.